One of the decisions you’ll need to make as a business owner is which email marketing software you’ll use. Most people start out with Mailchimp (because it’s free to start), but usually find out that it lacks some of the more advanced features that others like ConvertKit and ActiveCampaign offer. Not only that but as your email list grows, your costs go up with Mailchimp and when you’re paying for something that doesn’t have the features you need, it’s time to look elsewhere. I’ve tried practically every email marketing software out there. From Mailchimp to Drip to Actionectics (from Clickfunnels) to Aweber. I used ConvertKit for several years but recently decided to go with ActiveCampaign instead. I’m going to break down some of the reasons why in this post as well as compare their features and pricing structures. No matter what service supplier you select, at the end of the day you need to choose what feels right for you and your business. When I created the Making It Pay Lifestyle Course, ConvertKit was an extremely loved option among most of the leaders I know. It’s a robust choice and very easy to use for beginners. The landing page options make setting up opt-ins a snap, and their tagging system is wonderful for segmenting. Pricing starts at $29 per month for up to 1,000 subscribers and you get instant access to all of their features. The cost goes up once you hit different quantities of subscribers, but I love that even a newbie doesn’t have to pay extra for special features. I recommended it to my students especially if they were new to online marketing. There are some little things that I wanted that ConvertKit was missing. The tipping point for me was the ability to transfer an automation within ActiveCampaign. This saved me so much time, especially when creating my 52 automated email sequence for 52 Saving Tweaks a Week. I have future plans for more year-long challenges and all I’ll need to do is update the content, not re-create the entire automation. Another reason I was eager to switch to ActiveCampaign was the price. I could transfer my existing contacts (ActiveCampaign offers free migration for EVERYONE) and pay only $9 per month versus $29. Since I’m able to create landing pages on my site with the Divi Theme and Bloom Opt-In from Elegant Themes, I didn’t need ConvertKit’s landing page features. In fact, I can customize my own landing pages to match my branding must quicker than I could with ConvertKit. ConvertKit allows you to tag to segment your audience, but ActiveCampaign has options that do that automatically. This has also saved me time in knowing which contacts clicked on what content and what else they may be interested in. ActiveCampaign allows me to do A/B testing, which means I can try different subject lines and send them out to my list to see which one has a better open rate. 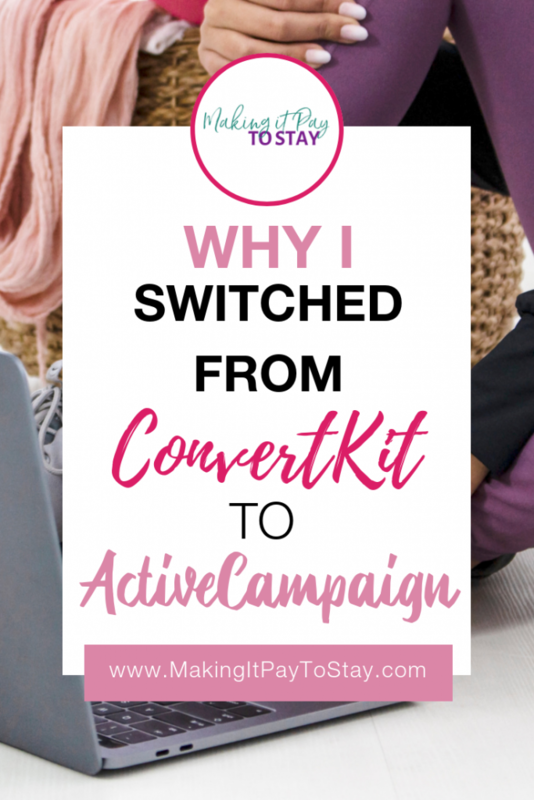 I still recommend ConvertKit for beginners and for bloggers, but I’m now recommending ActiveCampaign for business owners who have paying customers which very different interests that they need to track on their email lists. 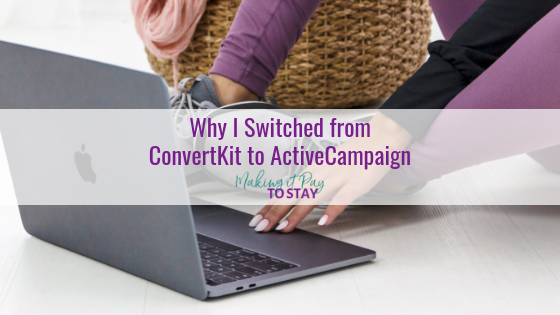 If you’re ready for new features and need specific data and integrations, ActiveCampaign is your best bet, but if too many options overwhelm you, I’d stick with ConvertKit.